You’ve plastered your job listing on every job board and social network known to man. Now comes the fun part: sifting through the hundreds or even thousands of applications. But how? How do you narrow down a seemingly endless stream of folks who all want to be a part of your team? Baremetrics is a remote company. We have no main office. We all work from a mixture of coffee shops and home offices. Most of us only actually meet in person at our company retreats. With a remote-only company like Baremetrics, when it comes to hiring, the bulk of the work comes in the interview stage. Most earlier stage startups don’t have an HR department, and so hiring usually falls largely on the CEO’s back. Hiring someone is, many times, the primary and full-time job of a CEO and so efficiently narrowing down who’s a good fit is the name of the game. Remote-only companies face a unique set of challenges when it comes to hiring. In general we have a much larger pool to hire from, but that’s not always a good thing. The “I want to work from home” crowd is…substantial. And arguably is made up of people who have, in fact, never worked from home. So what you end up with are hundreds upon hundreds of applications from people who aren’t qualified at all but think they are because they saw the word “remote” in the job listing. But even once you’ve got it narrowed down to people who are qualified, figuring out if they’re actually a good fit is quite difficult. All you’ve usually got to go on are a series of emails and a couple of phone calls or video chats. So how do you overcome those challenges? What are processes, tools and questions that can be used to streamline and make the process as painless as possible for both sides? 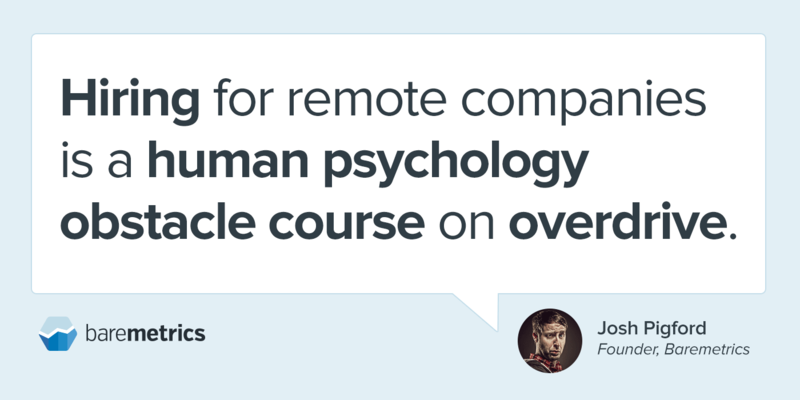 The hiring process for remote companies is a human psychology obstacle course run on overdrive. It’s not about skill or ability. It’s about understanding how both sides approach problem solving and the faster you understand how someone approaches problem solving, the faster you can make a decision. The “obstacle” is the job listing. It’s your responsibility to set the tone here. Yes, lots of people will skip over the contents of of the job listing completely and just read the position name and then look for the “apply” button, but the goal here is to help the person set proper expectations about what the job entails, what they’ll be responsible for and why they’d be a crucial part of your team. You’re trying to balance selling people on the fact that this is an amazing opportunity with also weeding out all the people who are just looking for a paycheck and nothing more. The more you detail you can give, especially around compensation and benefits, the better. But avoid being dry and clinical. Drive home that it’s a great opportunity and that your team genuinely needs someone in this role. Properly setting the tone here will make the interview process much easier. The last thing you want are 1,000 resumés in your inbox. The resumé is, for all intents and purposes, completely useless and should be ignored forever and ever amen. Burn them all. At the same time, you need some sort of measuring stick to quickly narrow down if someone will be a good fit or not. What we do is include a handful of what I call “filter questions”. These are questions that don’t require much work on the applicant’s part but give you a quick mechanism for moving someone on to the next stage. What is your work experience? — I don’t actually care where they’ve worked, I just want to see that they do in fact have some experience. For engineering positions you’ll get a lot of applicants whose only experience is some 4-week Rails bootcamp, and that’s just not our bag right now. Every position has some sort of quick indicator that the person simply doesn’t have the relevant experience you’re after. What city & country are you located in? — For a remote company, we can hire from basically anywhere, but there are locations that may make it more difficult. For instance, a 12+ hour time difference is a big hurdle that, unless there are some amazing benefits, probably won’t work out. Link to your portfolio or Dribbble profile — You’d be amazed at the number of people who don’t have a portfolio or any sort of prior work to link to. Include links to 2 specific examples of how you’ve used design to solve complex problems, along with how you solved those problems. — This question actually has three purposes. One: following direction. People love to just throw a single link to their portfolio here and call it a day. I didn’t ask for all of your work here, I asked for specific examples. Two: proof that you can in fact solve complex design problems. Three: a look into how you communicate. This is crucial in a remote environment. Why do you want to work at Baremetrics? — I hate asking this question only because I know I’d hate answering it. But holy moly is this a great one for filtering out folks. We’d double our MRR if we got a recurring nickel for every time someone just answered “because I need a job”. How would you make Baremetrics, as a product, better? — It’s important to find good problem-solvers. I don’t actually think someone will be able to effectively figure out how to make Baremetrics better without having really used the product. I just want to know how they approach problem solving. Again, these questions will vary slightly depending on the job. The key here is to give you a set of answers that you can use to quickly use to filter out people that don’t fit with what you’re looking for so you can focus on those who could be a fit. From the initial filter questions, one of two things will happen. If it won’t work out, I send a stock email thanking them for their time and encouraging them to check back in the future. Thanks for your application to Baremetrics. We don’t think there’s a great fit at this very moment, but I encourage you to keep an eye on the Jobs page on Baremetrics, and also keep us updated and consider re-applying as your skills grow and expand. If I do think there may be a good fit, I send a follow up set of questions. These are a mix of questions around working remotely as well as questions specific to the position itself. It requires a bit more work on both ends, but this gives me significant insight into how they communicate via text (which is unbelievably crucial in a remote setting). It’s also additional insight into, again, their problem-solving process. Here are those follow up questions using the Design position as our example. Tell me more about your current job. Are you happy there? — What’s their motivation for applying? What kind of projects are you working on there? — Will this new role be a big change for them? Or will they be able to jump in without hesitation? If you could be anything but a designer, what would you be? — This is about identifying healthy work habits. Do they have any hobbies? What other things do they think about besides their job? Why a startup over an established company? — This helps me understand their expectations. Sometimes people think “I want big piles of equity that’ll be worth hundreds of millions one day!” and that’s not healthy. Have you ever been self-employed? — Running your own business, even if just as a solo freelancer, is a big bonus as you’re much more likely to jump in and do the work and help out even if something is “technically” outside of your job description. Have you worked from home/coffee shop/co-working space before? — Hiring people that have not worked remotely in some capacity is an uphill battle that can present a lot of issues. I ideally want to hire people who have systems in place so they don’t get burned out. I also, at this point, always ask if there are any specific questions they have about Baremetrics or the job and we’ll usually exchange a couple of emails about that. Assuming all the previous answers checked out fine, it’s time for a video chat! The video chat step is a mix of figuring out if they’re decent at making themselves available for a quick chat (which is especially important if there is a major timezone difference), along with just making sure they are who they say they are. We use video chat a lot within the team and being able to clearly communicate verbally in English is part of the deal. Doing a 5-10 minute chat verifies that and also gives you an opportunity to get to know the person a bit more. One of the hardest parts of hiring, at least for me, has been this idea that someone is potentially quitting another job to come work with us. That’s just a lot of weight and responsibility (as it should be). So having as strong of an idea as possible of what it’s like to work with someone is a big deal. Just about every job type lends itself towards some type of test project. Doing the test project isn’t necessarily about getting some sort of useable deliverable. It’s about figuring out if they can hit the deadlines they set, if they’re actually able to do the calibre of work they’ve shown before and if they respond well to criticism. Also, it’s also perfect insight into how they, you guessed it, problem-solve. Worth noting: We’ve gone back and forth between doing paid test projects and haven’t really seen a difference one way or the other with willingness to do the work. Usually we try to keep the project limited to a few hours of work. Generally something they could knock out on a weekend or over a couple of evenings. After the test project, I’ve got everything I need to make a decision on that person. It’s usually at this point that we’ll get really specific with salary and equity as I’ll have a much better idea of their abilities and what they’ll be bringing to the table. If all goes well, we’ll add that person to the team! If not, we’ll head back to the drawing board and keep repeating the process. Every company is different and what criteria works for one company, won’t necessarily work for another. As the founder, or whoever is heading up the hiring, efficiency is the name of the game unless you want to spend a whole year processing job applications (you don’t). Identify ways to quickly narrow things down. The more you do it, the more comfortable you’ll get with finding good markers for who would/wouldn’t be a good fit for your company.